In the 60 years since the New Jersey State Bar Association created a nonprofit corporation, countless New Jersey citizens have been enriched by the work of the New Jersey State Bar Foundation (NJSBF). These six decades have seen the establishment of programs that continue to impact New Jersey civic life today, from mock trial competitions to teacher trainings on bullying prevention and conflict resolution; from examinations of pressing societal issues like domestic violence to publications and programs that explain the intricacies of the law to every age group. In the early years, the foundation functioned largely as a conduit for bequests. In the 1970s, through the generosity of donors, the NJSBF created a scholarship program for law students. During the 1980s, a group of trustees breathed new life into the foundation as they pursued a fundraising campaign to build the New Jersey Law Center. “As far as I’m concerned, that is the most satisfying and rewarding thing I’ve ever done in my life,” said Vincent Apruzzese, who served as chair of the NJSBF from 1985 to 1987, and spearheaded efforts to create a permanent headquarters for foundation and association programs. 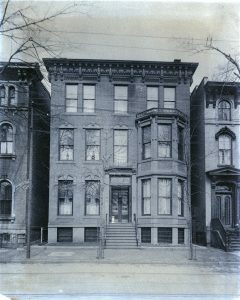 At the time, both the foundation and the association were housed in a four-story brownstone in Trenton. The idea was to build a facility that would serve as a hub for attorneys and legal education in the state. The building, on the Rutgers campus, opened to the public in Dec. 1987. Another of Apruzzese’s favorite memories of working with the foundation in the mid-1980s was working with Fred Friendly, the former head of CBS News and a pioneering broadcast news personality. Friendly worked with the foundation to host his constitutional law discussions—the Fred Friendly Seminars—at high schools in north, south and central New Jersey. He also moderated a number of programs at the Law Center, both for the foundation and the association. “It seems to me the legal profession has an obligation to assist the community in learning about how the system operates, and to share with them what their rights are,” Apruzzese said. A highlight of foundation programming in the early 1980s and beyond was the Reporters and the Courts Conference. For the inaugural conference, held in April 1982, 150 newspaper, television and radio journalists came to Trenton to exchange information about the press and the justice system. Frank Hoerst, who served as NJSBF president from 1983 to 1986, recalled those conferences with fondness. “Because so much of the law and what lawyers do is reported in the media, we wanted the media to have exposure to the nitty-gritty of courtroom events, so that when they reported on it, they would have a lot better understanding,” he said. Reporters weren’t the only segment of the population exposed to the nitty-gritty of courtroom events. In 1982, the foundation started what would become one of its most popular programs for decades to come—the state’s mock trial competition. The program was an effort to increase student comprehension and demystify the justice and legal systems. More than 70 teams entered that first year and thousands of high school students from across New Jersey have taken part since. In 2018, 220 teams participated in the program. In 1988, the foundation’s public education initiatives received an even greater boost with the formation of the Interest on Lawyer Trust Accounts (IOLTA) program. According to New Jersey Supreme Court Rule 1:28-A, 12.5 percent of IOLTA funds are disbursed to the foundation for law-related educational programs. Buoyed by the new funding, the foundation was able to introduce a host of new programs. In 1990, the foundation aired television commercials with public service announcements regarding aspects of New Jersey law. In addition, programs for senior citizens, a speaker bureau, and school-related trainings became staples of the foundation’s daily work. The mock trial competition was expanded to include younger students through the Law Fair and Law Adventure programs. In 1996, the foundation launched Legal Eagle, a legal newspaper for kids that puts important legal issues into language and frameworks appropriate for New Jersey’s younger citizens. In 2001, the foundation started Respect, a newsletter for students on diversity issues. The two newsletters—and corresponding online blogs—today reach thousands of elementary, middle and high school students annually. The foundation was a pioneer when it launched a teasing and bullying prevention program in 2001, long before anti-bullying programs were making headlines around the country. The foundation created curriculum and training for teachers to encourage positive school climates across the state, and the sessions continue to be incredibly popular today. Richard Badolato, who served as president of the NJSBF from 2009 to 2011, calls the foundation “the jewel of the bar association.” The organization, he said, educates the public—and particularly schoolchildren—in many ways. Mary Lou Parker, who was foundation president from 1997 to 1999, agreed. “The educational programs put on by the foundation were instrumental in providing the public with a greater understanding of their rights and the law,” she said. “The educational programs span all age groups, from elementary school through high school through senior citizens…As a former schoolteacher, I always felt sort of a particular pride in all of the programs that were geared to students. “I just thought it was exhilarating to serve on the foundation because it shows lawyers at their very best,” she said. In honor of the NJSBF’s 60th anniversary, consider making a tax-deductible donation to the “$60 for 60 years” campaign. All donations made in honor of our 60th Anniversary will be recognized on engraved bricks installed on the portico of the New Jersey Law Center. For more information about contributing or volunteering, visit the foundation website, njsbf.org. Does the U.S. Constitution Need a Re-Write? Equal Justice Under Law—Is Everyone Included? We believe “informed citizens are better citizens” and understanding laws that affect your daily life makes a difference. Please help the New Jersey State Bar Foundation make a difference by making better citizens. All donations are tax deductible. Join the NJSBF Email List and get our newsletter, Foundation Spotlight, delivered to your inbox. You’ll also be notified about upcoming seminars, trainings, events and publications.